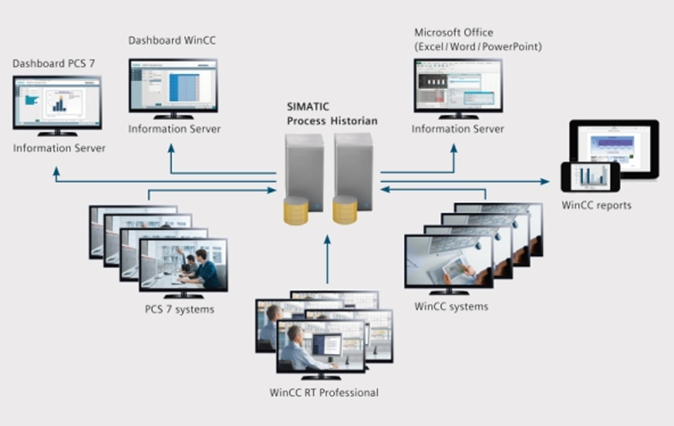 SIMATIC Process Historian provides high-performance long-term archiving functionality for perfect integration into the SCADA System WinCC: Process data and messages can be written to central archives in real-time mode, without additional engineering efforts. SIMATIC Process Historian replaces the previous WinCC/CentralArchiveServer option. Real-time, central archiving of company data facilitates fast decision making on the basis of secured data for increased productivity and reduction of costs. SIMATIC Process Historian is scalable. The data is acquired from any WinCC Station and archived in real-time. There are no restrictions with regard to the number of WinCC subsystems (single-station systems, or redundant servers) or data quantities (tags, alarms). This facilitates fast decision making on the basis of secured data and represents the first step towards the increase of productivity. Thanks to its seamless integration in WinCC, as well as redundant configurations, SIMATIC Process Historian meets ultimate security demands at minimum administrative expenditure. You may always implement system expansions without interrupting production. 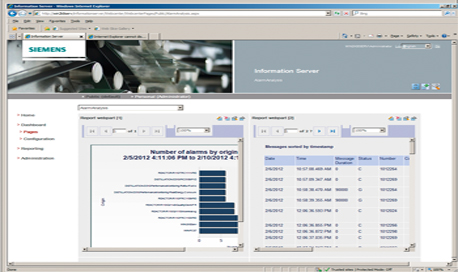 SIMATIC Information Server supports the creation of target group-oriented reports and analyses of historical WinCC data on the basis of Microsoft Reporting Services. 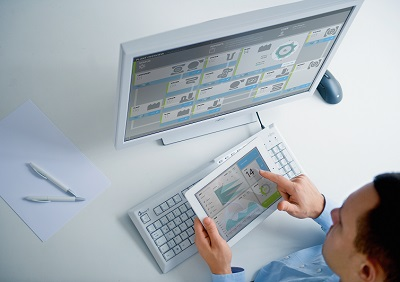 The reports created are always available on Web-based user interfaces. Using SIMATIC Information Server, you are always provided with comprehensive data that is tailored to suit you requirements. You can create report templates based on global system data for specific target groups, without specific programming knowledge. The transparent access to all archived production values provides you with all necessary task-related system parameters (management, quality assurance, maintenance). Weak points are disclosed and necessary optimization measures can be derived quickly and efficiently to increase plant productivity and availability. The integrated reporting system is based on the Microsoft SQL Server Reporting Services and provides interactive reporting services in the form of Web-based analyses. Integration in Microsoft Word, Excel or Powerpoint also lets you access history data using the tools you know from the Office environment.